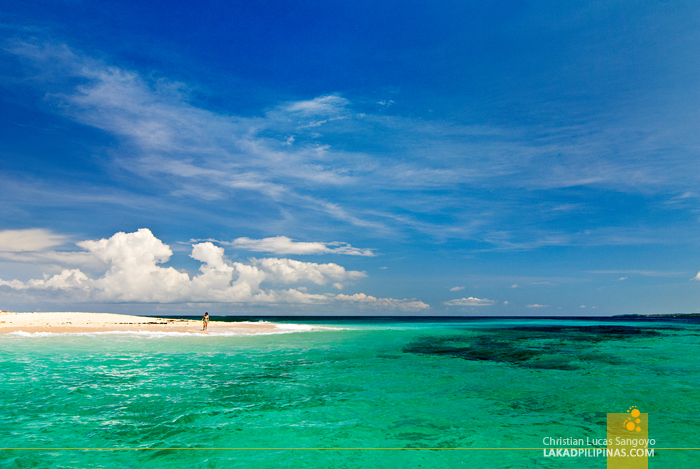 The sea was sparklingly green and the sky, a deep cobalt blue. On the horizon, an island emerges, blinding white sand encircling its fringes. We went to Dasol on the trail end of a storm; the sky gray, and the sun, persistently hiding beneath a thick blanket of clouds. Beautiful weather was the last thing we expected as we rode an outrigger boat and headed for an island hopping adventure from Tambobong Beach. With J and C as travel companions, we negotiated a deal with a local fisherman, Kuya Bong, for an island hopping tour of Dasol. Php800.00 is the standard rate, inclusive of visiting the popular Colibra Island, a pass thru of Crocodile Island and a visit to Balas Nagtaros Island’s Cabacungan Cave. But since we also wanted to see the Balinmanok Wreck on the northwestern part of the town, an additional Php100.00 was asked for. At Php300.00 each, I guess it wasn’t too bad a deal. Kuya Bong wanted to go as early as six in the morning but we were still groggy from sleep and haven’t had no breakfast yet. It was two hours later before we set sail. With three liters of Red Horse Beer, a bucket of ice and some chips, we were ready as can be. 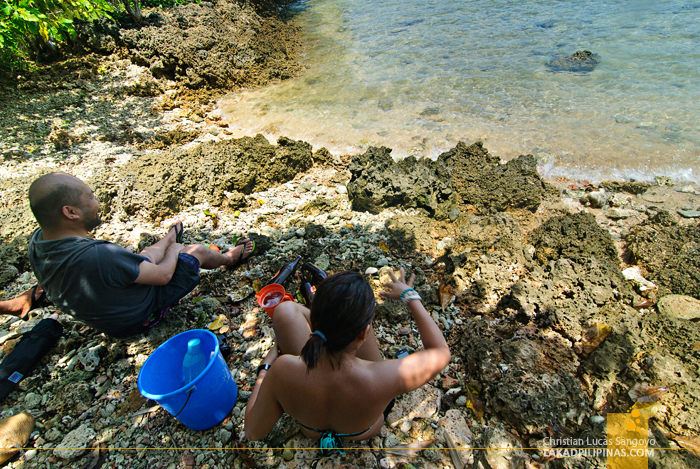 The Balinmanok Wreck is not that far from the R Paradise Beach Resort where we were staying. It only took five to ten minutes and we were at the wreckage site. Out boatman explained that the vessel was from Taiwan and was shipping 600 kilos of methamphetamine (shabu) upon its hold. The boat anchored at the Hermana Mayor Island due to a storm. Its hull got damaged and was towed to its present site. We initially planned on snorkeling at the Balinmanok Wreck, but since there was no ladder to get back on the boat, we scrapped the idea. 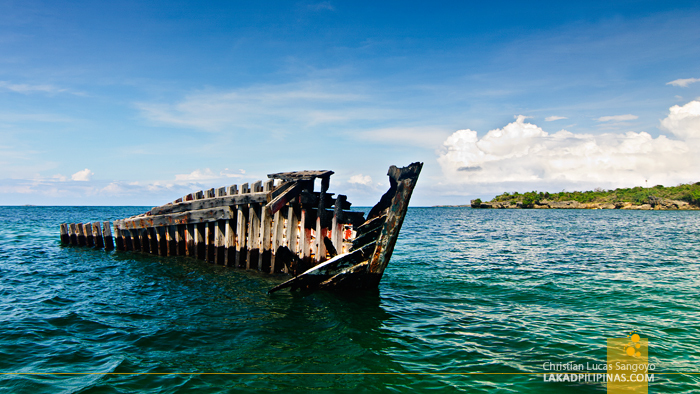 From the wreck, we proceeded to the most popular site in Dasol, Colibra Island, also known as Snake Island. We can’t believe our good fortune; the weather has turned from gray and overcast to bright and sunny in just a single day. The only problem was the waves. It was quite strong during this time of the month and docking into Colibra proved to be a challenge. C dove ahead, leaving us guys on the boat scratching our heads on how to dock on the island. We begged our guide to at least move as close to Colibra as possible so we can at least throw our cameras on the ground before disembarking. With great maneuvering prowess, he finally made it possible. Colibra Island looked more stunning than when I first visited it four years back. 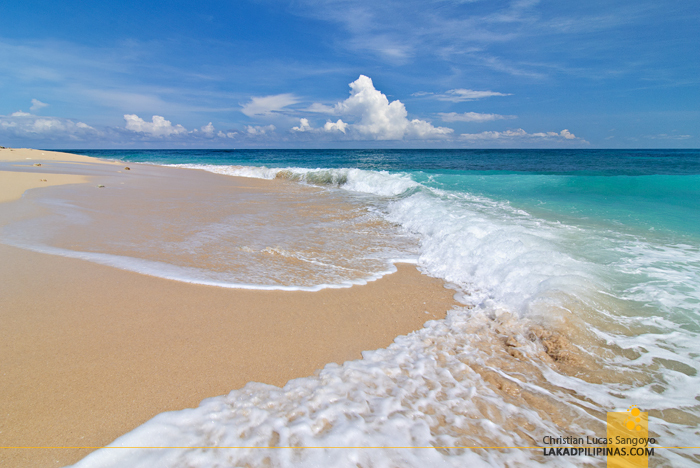 The shore seemed wider and the sand, finer. It was just too bad that we’d left all our contraband back on the boat and we’ve nowhere to hide under the intense rays of the sun. So after some minutes of taking photos, we’re back on the boat again. 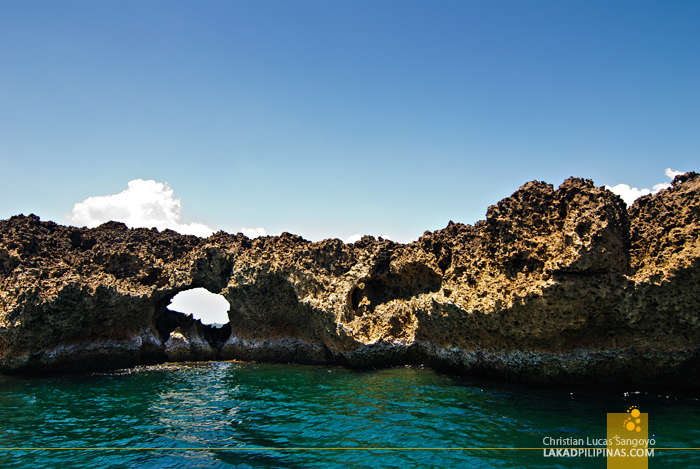 Passing through the rugged Crocodile Island, so named after its shape and the natural eyehole made by a through and through cave, we chugged on. I’m not sure if there’s a natural landing site at the island, but with way the waves were rolling, I didn’t think it was possible that time, even if there was. 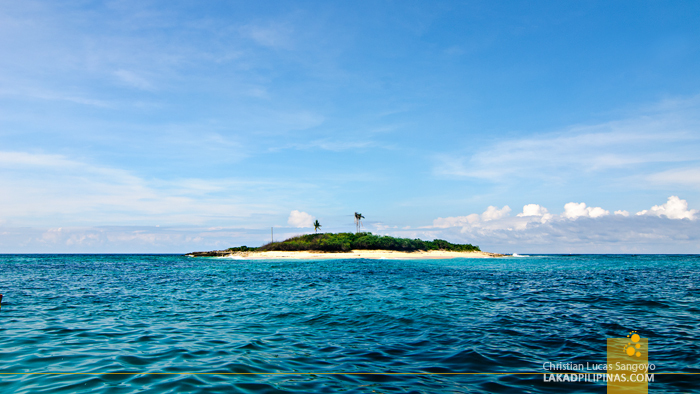 At last, we came to the last island on our list, Balas Nagtaros. 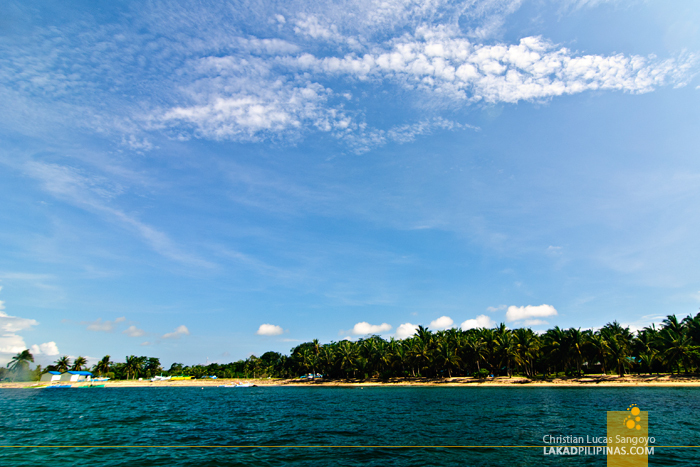 Initially, I thought the name of this island is Cabacungan, after the name of the famous cave it houses. 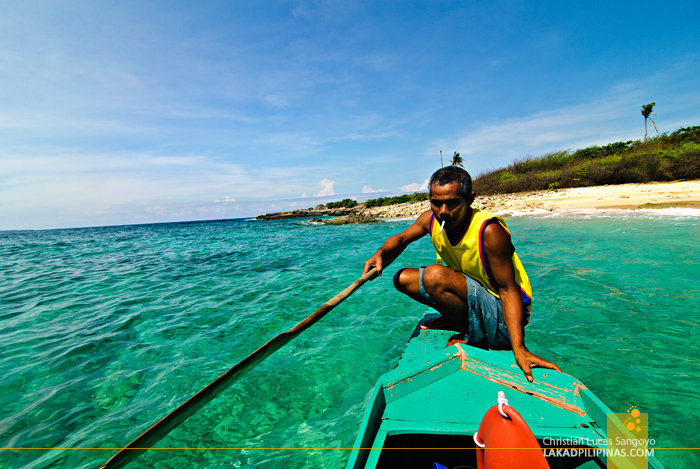 But upon asking our boatman, he told us that Cabacungan is one the name of the cave and the cove where it’s located. 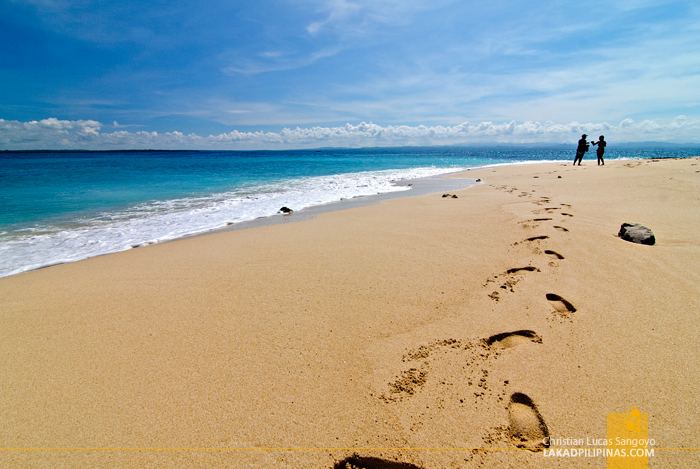 The real name of the island is Balas Nagtaros. Docking on the usual beach to access the island was not possible due to the harsh waves, so we have to go around and land at a natural channel that besets Nagtaros and the mainland. 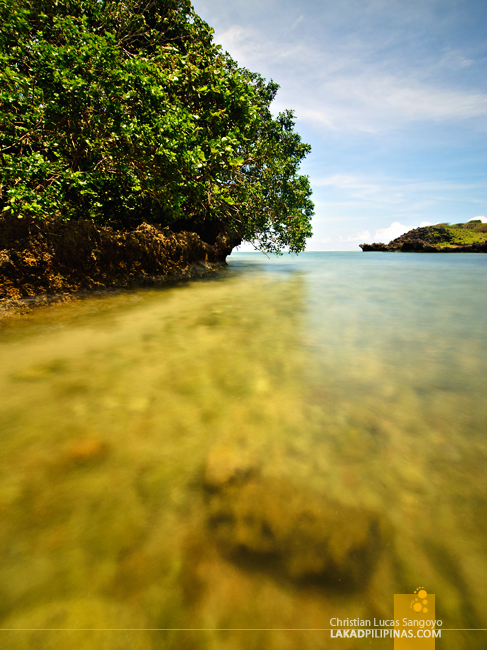 The water here was a hundred times calmer; we were even able to snorkel a bit before unloading our beer and having a cool drink under the shade of a Talisay tree. The three liters of Red Horse seemed to empty faster than usual, due maybe to the extremely hot weather. 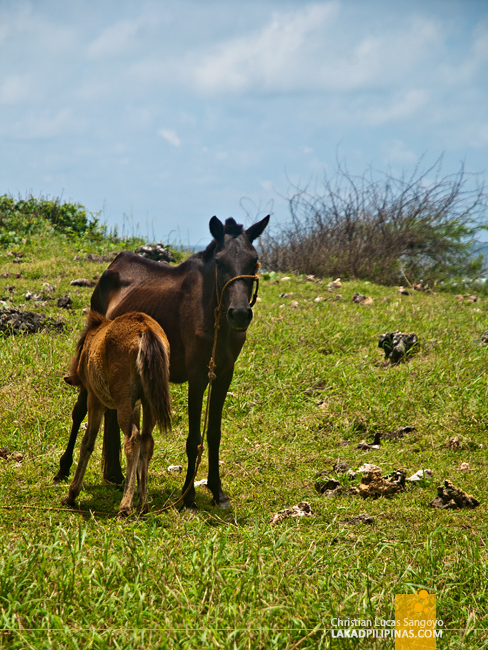 That led us to climbing the grassy knoll above the island where more horses, albeit brown ones, awaited us. Apparently, Cabacungan Cove is just two jumps away from where we were and we were clambering down once again in a matter of seconds. 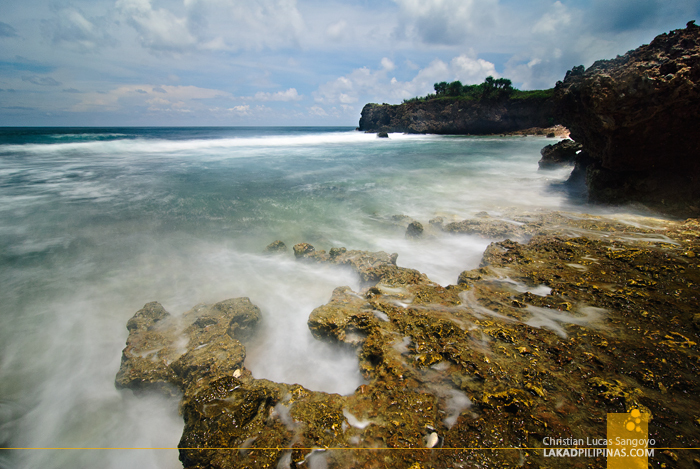 What greeted us at the other side of Balas Nagtaros was the raw pounding of booming waves against a rocky shore. The waves at Cabacungan Cove were so wild, it was impossible to access the cave that we went here for. C was brave enough to swim at a clearing in the rocks, but us guys contented ourselves into simply taking photos of the slamming waves. 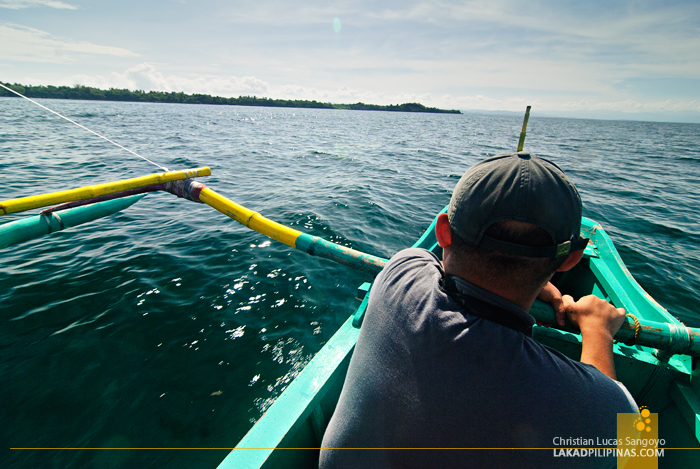 With a slight buzz hanging over our head, we wended our way back to our boat and asked Kuya Bong to bring us back to civilization. We needed more horses. 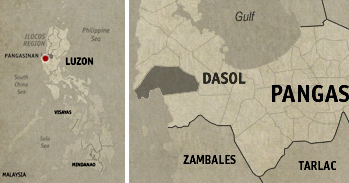 How do you get here from Manila?